30 days English training,30 Days Certificate Course in English, Primary Teachers Training,English Language Teaching Course to Primary School Teachers: TS SCERT, Director, School Education, Course No.16, 30 days Certificate Course in English Language Teaching for Primary School Teachers / Teacher trainers from 14.11.2017 to 13.12.2017 - Deputation of teachers for training. Sub:- SCERT, Telangana, Hyderabad - Course No.17, 30-days Certificate Course in English Language Teaching for Primary School Teachers/Teacher trainers from 18.12.2017 to 17.01.2018 at RIESI Bengaluru. 1.RIESI Bengaluru institute Annual Plan Circular dated 24.05.2017. 2. Lr. No. RIE/TRG/CELT/Pry/Member States/2017-18/330, dt 24.11.2017. It is informed to all the District Educational Officers that Regional Institute of English, South India, Jnanabharathi Campus, Bengaluru is going to conduct 30-days Certificate Course in English Language for primary School Teachers/Teacher trainers every year. The programme for the year 2017-18 is scheduled from 18.12.2017 to 17.01.2018. One primary teacher teaching English language is to be identified from each district. The selected list of teachers should reach to the SCERT on or before 11­-12-2017. They are expected to take precautions in selection of teachers according to the criteria mentioned below. Is healthy and doesn't have acute chronic ailments that obstruct the purpose. Suitable representation may be given to women's, SC/ST/OBC categories. Newly recruited teachers may be given preference for undergoing the training. Those teachers who have undergone the 90/30-day RIESI training and the same 30-day training are not eligible. Should be below the age of 50 years. The boarding and lodging facilities will be provided by the RIE institute, and the travel allowance of participants from the work place to RIESI Benguluru and back to work place will be arranged by the SCERT, Hyderabad. While communicating a copy of the reference 2nd read above, all the District Educational Officers and Principals, Govt. DIETs in the State are requested to send the names of three eligible Primary Teachers I one Teacher Trainer of the district concerned for 30 days Certificate Course in English Language Teaching for Primary School Teachers / Teacher Trainers from 14.11.2017 to 13.12.2017 at Regional Institute of English, South India, Bangalore by the following the norms/guidelines stipulated by the RIESI in it. The teachers / teacher trainers list should be sent along with any one Primary Teachers I one Teacher Trainer reserve candidate name by 05-11-2017 in return e-Mail to this office e-Mail address, to enable to take further course of action in the matter. The hard copy of the teachers / trainers list should be sent in due course. This reference should be treated as most urgent. Action should be taken accordingly. SCERT Telangana - Rc. No. 112, Dated:30-10-2017 - Sub: O/o. SCERT, TS, Hyderabad - Course No.16, 30-days Certificate Course in English Language Teaching for Primary School Teachers classes 6th, 7th & 8th /Teacher trainers from 14.11.2017 to 13.12.2017 at RIESI Bengaluru. Ref: 1. Lr. No. RIE/TRG/CELT/Pry/Member States/2017-18, dated 21.10.2017. It is informed to all the District Educational Officers that Regional Institute of English, South India, Jnanabharathi Campus, Bengaluru is going to conduct 30-days Certificate Course in English Language Teaching for Secondary School Teachers/Teacher trainers every year. The programme for the year 2017-18 is scheduled from 14.11.2017 to 13.12.2017. One English language teacher is to be identified from each district. The selected teacher's information with full address and contact No: should reach to the O/o SCERT on or before 5-11-2017. They are expected to take precautions in selection of teachers according to the criteria mentioned below. • Is healthy and doesn't have acute chronic ailments that obstruct the purpose. • Suitable representation may be given to women's, SC/ST/OBC categories. • Newly recruited teachers may be given preference for undergoing the training. • Those teachers who have undergone the 90/30-day RIESI training and the same 30-day training are not eligible. • Should be below the age of 50 years. Proceedings of the Director of SCERT, TS, RC.No.1433 Dated: 18/11/2016, Subject: School Education - Course No.14 - 30days Certificate Course in English Language Teaching for Primary School Teachers / Teacher trainers from ............ - Deputation of teachers for training - Orders - Issued - Reg. 1. Annual Plan Circular, Dated 05/05/2016 of RIESI . 2. Letter No.RIE/TRG/CELT/Pri-Crs No.14/Ap-TG&KT/2016-17/594, Dated: 11.11.2016 of the Director, RIESI, Bangalore. While communicating a copy of the reference 2nd read above, the District Educational Officers and principals, Govt. 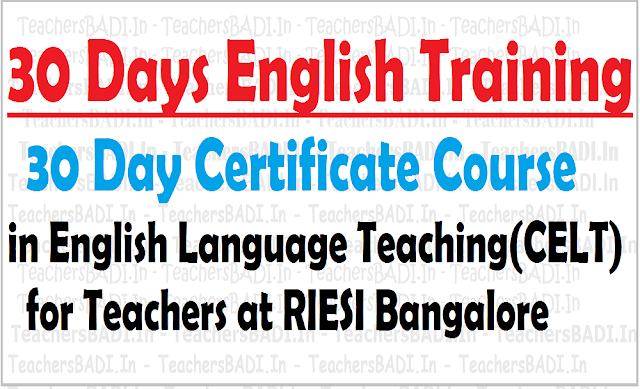 DIETs in the State are requested to send the names of two eligible Primary Teachers / one Teacher Trainer of the district concerned for 30 days Certificate Course in English Language Teaching for Primary School Teachers /Teacher Trainers from ,,,,,,,,, at Regional Institute of English, South India, Bangalore by the following the norms/guidelines stipulated by the RIESI in it. The teachers I teacher trainers list should be sent along with one reserve candidate name by 26-11-2016 in return e-Mail to this office e-Mail address, to enable to take further course of action in the matter. The hard copy of the teachers/ trainers list should be sent in due course. This reference should be treated as most urgent. Action should be taken accordingly. A 30-day CELT Programme for Primary school teachers of your state is scheduled from .... at this Institute. Hence we kindly request you to Identify 23 Primary School teachers/Trainers from different districts who are teaching English at the Primary school level and to depute them to RIES! Bengaluru to attend the 30-day CELT Programme from ..... Please send the list of identified teachers for the training programme well in advance to the Institute so as to enable us to make arrangements for their accommodation. We would also appreciate it very much if you could kindly make a reserve list of 10 teachers for use if necessary. The criteria for selection of teachers, facilities available at RI ES I and the course details are enclosed. Information to be sent to the trainees is also enclosed.We observed that the participation of teachers for the long term programmes was very poor. I request you to kindly take appropriate action to depute teachers and make use of full quota allocated to your state. Soliciting your kind co-operation. suitable representation may be given to women's, SC I ST I OBC categories. those teachers who have undergone the 60/30-day RIES! training and the same 30- day training are not eligible. It is a residential training course. A stipend of Rs.80/- per day is allocated and this amount will be adjusted towards the boarding and lodging facilities provided by the Institute and contingent expenditure including course materials. The State department is requested to arrange travel allowance of participants from the work place to RIESI Bengaluru and back to work place. Certificates indicating the grade of achievement will be issued to the participants. Medical help with a doctor visiting the Institute twice a week. Trainees for the above course should report at the Regional Institute of English on the morning for Course 2016-17 without fail. They should meet the Administrative Officer soon after their arrival. Jnanabharathi Campus of the Bangalore University, situated on the Bangalore - Mysore Highway, about 10 Kms, from the centre of the city i.e., City Railway Station or Bus Station (Majestic). You can take one of the buses in the following BMTC city bus routes, to reach Jnanabharathi Campus. The stop to alight is the same as above. At the University Ladies Hostel, take a left turn and walk about a Km to the JUE Campus, situated next to the University Physical Education Department Hostel. It is advisable for the trainees to arrive and get settled a day before the start of the course. Teachers deputed for training are instructed to join the course without fail and no representation for cancellation of this order or for leave will be entertained. Failure to comply with the instruction will be construed as defiance and will expose them to disciplinary action. 09:45 AM - 05:00 PM - on all working days. Trainees ought to be punctual in attending classes. Unpunctuality and irregularity will be viewed seriously and may result in the trainees being sent back. Trainees draw their normal salaries in the manner ordered by their respective State Governments. The Institute DOES NOT pay TA I DA for their journey to and fro. A stipend of Rs. 80/- will be adjusted towards boarding and lodging and contingent including course material. Men trainees are accommodated in large dormitories at the Men's hostel and women trainees in the Working Women's Hostel. Trainees will be provided free accommodation. The hostels has metal cots. We also provide mattresses and pillows and mosquito nets & for cleaning the rooms a fee of Rs.20/- per day per trainee will be collected from their stipend. Vegetarian food with bed coffee, mid morning I mid evening tea, lunch and dinner will be served in the mess/canteen. The Institute provides plates and tumblers to the trainees. Self-service is the mode of servmg. A doctor visits the Institute and is available for consultation twice a week ie on Mondays and Thursdays. The Regional Institute of English South India has a well-equipped library that has nearly 30,000 books on ELT and gets important national and international periodicals and journals. The library will be open from 09:00 AM to 08:00 PM on all working days and from 10:00 AM to 5 :00 PM on holidays and Sundays so as to enable the trainees to make the best use of the library. There is a Language Laboratory here, with 20 booths where the participants can take individual practice in listening and speaking that provides feedback on every individual's improvement in Spoken English and Grammar. Facilities are provided in the Institute for the participants to play games and take part in cultural programmes. Copies of Textbooks (detailed and Non-detailed) I workbooks in use for classes Copy of the syllabus in English for secondary classes. A set of question papers (English). Bangalore weather is warm during April - October and cool during November - March. Trainees will sign for the items of furniture, steel plates and tumblers and other equipment issued to them as soon as they arrive. They will have to pay for any loss or damage. They will be responsible for the safe custody of their own money, mobiles and other valuables. Trainees will strictly observe the mealtime notified.